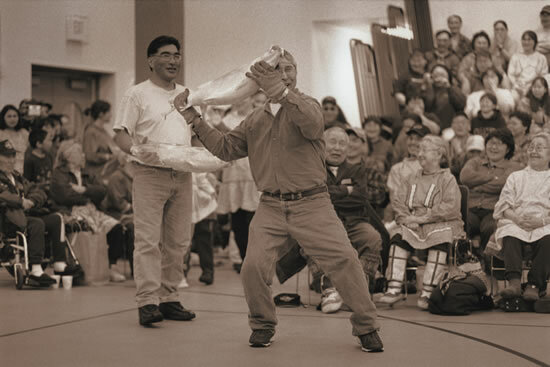 Men proudly display frozen fish as part of the presentation of gifts during the Kotlik Messenger Feast. Tuaten-gguq ayuqellria tuvqayutuli cali ingna erneq aipirluku unguvaaqut. They say those who are generous with food are given another day to live. Nutaan kassiyurraarluteng tua-i, elliraat, aipianret-llu aklukaitnek nutaan aruqluki ciumek pistairutellriit, aatairutellriit, arnamek-llu mingqestekairutellriit. Tuaten ayuqellruuq yuraryaraq augna atullerput aulukiluni. After food was distributed, they would distribute the items gathered for the festival to the orphans, widows, those who had lost their fathers, or women who sewed things for them. That is how the tradition of dance took care of people. Ilaminek tuvqayugturquni atam, wall'u nerevkariurluni allanernek, ca qunukevkenaku yugnun ikayuuteku'urquniu, imutun neqa cakaniyuilngurtun ayuqeciquq. Tuamtell' iliini iciw' tua-i egan una ikgelngermi, yuut-llu amllerrluteng, una-ll' nangesciiganani. If a person is generous with others, always inviting visitors, if a person isn't stingy and is ready to help others with food, her food supply would never seem like it was used up. And sometimes even though cooked food in a pot wasn't a lot and many people were there to eat it, there would still be some left.